I’ve got a multi-day, mens gaming retreat coming up I was just lamenting to a friend of mine that I’ve got so many games that I haven’t played in a while that I was going to have to find some one-on-one time with the rules to refresh my memory. So, what’s the best course of action when faced with a stack of 10 or 15 games that you like but haven’t played in six months or more? Make that stack 15 or 20 games…that’s what I say! To rationalize a bit though, I figured that if I’m going to be relearning some older games then I might as well also learn some new ones. And…and…how can I ignore the upcoming opportunity to game for several days straight? I mean, to not have some new games to try out and share, well…well, that’s not right…right? Right. TriasDinky dinos on a modular board. Supports 2-5 players and you’re done in 45 minutes. I thought this would make for a good filler and a nice fit for some lunchtime office gaming. FjordsI thought Lisa might like this one and it would also be a good candidate for lunchtime office gaming, a filler for two waiting for a another gaming table to break up, and you’re out in 30 minutes. TaluvaI can’t rationalize this one but I’ll give it my best shot. I bought this one on looks mainly. The 3D Java-ishness, and the uniquely shaped wooden bits are really eye-catching. Rio Grande Games is releasing this title at the end of this month and after exchanging a few emails with Thor at Game Surplus I got them to put up a pre-order page for it and I threw a copy in my basket. This title got some nice reviews at Essen this year and I’m excited about getting a copy so early in the US release. Hammer of the ScotsI’m neither a wargamer nor a wargamer wannabe, but I like the theme of HotS, I like head to head combat for two, I don’t have a block wargame in my collection yet, and I thought a title of this nature might broaden my horizons a bit. To wargamers, this is the ‘Ticket to Ride’ of the genre. By that, I mean that this is light gaming. I suspect I’ll find it pretty cerebral but a two hour battle is pushing the ‘fun’ envelope for me. You’ll not see me playing Europe Engulfed listed at 720 minutes of fun for 2-3 players. Bison: Thunder on the PrairieWhen I went to check out I saw Bison on my Game Surplus wishlist and I’d completely forgotten about it. I have several area influence games but I haven’t tired of them yet. I liked the look of the tiles and I’ve always been happy with the quality of Phalanx games so I went ahead and tipped a copy into the cart on my way through. I’m constantly on the lookout for games to read about, to purchase, and yes…to even play. Many games are totally misaligned with my tastes, others look interesting but I can’t see myself owning them, others are a great fit and I put them on my want list immediately, and still others look so tantalizing, have high ratings, and yet, I just can’t bring myself to buy them…or should I. Okay, the theme doesn’t grab me. Controlling the national political parties of Germany through seven sequential political races sounds darned dry. The weight of gameplay is a rotund 4.4 with a length of play stretching past four hours which means it would probably take about three weeks for my group to finish a game. It’s just been reprinted and is widely available for less than $30 at Game Surplus…and it’s the 8th highest rated game on the geek at 8.18 out of 10. My collector gene wants to get it simply for its status as a classic but I know I’d never play it with my group. With Die Macher, the urge to buy is pretty low and I’m okay with not having a copy gathering dust on my shelf. A classic game, held high by those that love heavy games, but this one is not for me. Weighing in at a hefty 3.44, this game for 3-5 players lasts about three hours and depicts a medieval world of political intrigue as players vie for dominance over the land. The game uses a cornucopia of mechanisms including simultaneous action selection (one of my favorites), variable player powers, auction/bidding, area movement, and campaign/battle cards. As if that’s not enough, the game borders on being uncategorizable falling into the bluffing, negotiation, wargame, medieval, political, and novel-based categories.At first blush, I’d discount the game as a total misalignment like Die Macher but the theme is one I enjoy. I have a hard time putting down historical fiction set in the medieval time period and this game, coupled with what appears to be superb production quality makes me wonder. Now, would it ever get played in my group? Not on your life. I’m not a wargamer but some wargames appeal to me in spirit and in looks. I have to admit Friedrich has been on my radar for quite a long time but like Die Macher, I just can’t ever see finding anyone to play it with. The game has a unique aspect where one player plays Prussia and the rest play Russia, France, and Austria. It’s an all against one game trying to defeat Prussia. From the geek, the game presents itself with a slim set of rules (for this genre of games at least) uniting standard wargame mechanics and cardplay.Friedrich’s is of lighter weight than Die Macher at 3.35 and it does clock in at taking slightly less time (3.5 hours) but those numbers would do little to encourage it to see the light of day at any table in my house. I suspect I’m being suckered in by the wooden bits and the great map art but it makes no sense to purchase it and then have it sit on the shelf. Weighing in at 3.24, Hannibal: Rome vs. Carthage is held up by the wargame community on the geek as being the game to have in your collection. It’s ranked a whopping 8.2 and takes about 2.5 hours to play. The game uses a card-based system to decide the victor in the struggle between Hannibal and the Roman Empire in 200 B.C.This two-person, head-to-head game sounds like something Days of Wonder would produce a plastic miniature game system for but alas this game has been around a long time and was out of print for years. However, Valley Games recently announced that a reprint was in the works and the game with new artwork will be on the shelves in the not to distant future. Would one or two people in my group be up for a lengthy head to head game? I doubt it. Weighing in at 3.07 and at two hours, Hammer of the Scots is another two-player wargame retaining a high 7.89 rating on the geek. HotS, a ‘block’ wargame depicting the rebellion of William Wallace (Braveheart), is held up as one of the top, if not the most playable block wargame. The rule book is only 8 pages, slimmer than some heavier Eurogames!I’m very inclined to purchase this game to have at least one good block wargame in my collection. I’ve read many historical fiction novels set in this time period and I can easily see myself immersing myself in the theme (well , as much as one does in a boardgame). This game seems to have it all including the ‘fog of war’ where your opponent doesn’t necessarily know who their up against since units are drawn randomly from a supply and their type and therefore their abilities for attack and defense are known initially to only one player. Would others in my group player HotS? If coaxed enough…then maybe. I’m tempted to place this one in my next order regardless. Okay…I’ve cheated a little bit here because I actually own this title. Has it ever been played? Unfortunately no, it has not. BaM is of a higher weight than Hammer of the Scots and is, by most, considered a more cerebral experience than other games in its class garnering the title of the “chess of wargames”.The game depicts the French army under Napoleon Bonaparte as he was taken by surprise and attacked by the Austrian army near the town of Marengo. The game plays in about two hours and uses a unique blending of action point allowance with the advancement of time ticking away the rounds of the game adding realism from the actual battle. The fog of war exists in much the same fashion as Hammer of the Scots but there are no card-driven mechanics that add random elements to the game. The game is truly a battle of wits for two. I must admit I purchased the game on hype, or rather I put the game on my wishlist and my wife gave it to me as a Christmas gift in 2005. Earlier in the year, I had been walking through the Origins conference floor and back in the corner I stumbled across a thin man at a booth hawking his wares. As it turns out, I had been granted a quick run through of the game from a 50,000 foot view by the designer Bowen Simmons. After some investigation into the game that evening, I thought I’d give it a shot. …and there it sits gathering dust. But I really want to play it and I’ve almost convinced one of my group members to give it a shot at an upcoming extended gaming retreat I’m planning. Age of Steam is an older (2002) game for 3-6 players. 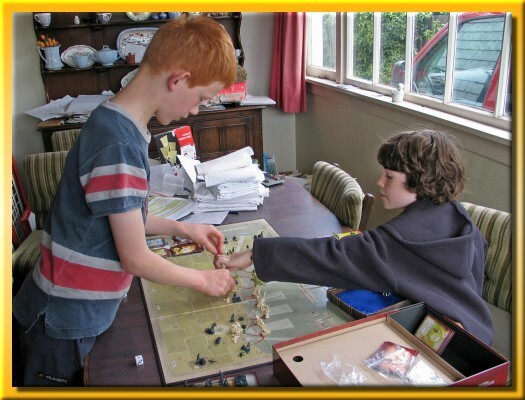 Train game aficionados are passionate about their games much like wargamers and the geek is rife with different factions sparring over what is and what is not a train game. The closest thing to a train game that I have in my collection is Stephenson’s Rocket (Reiner Knizia) which is not even considered a train game by those that know since it doesn’t involve the shipping of goods to increase wealth. I inflicted Stephenson’s Rocket (purported to be in the process of being reprinted) on my group two or three years ago and haven’t been able to convince them to try it again.Weighing in at a belt snapping 4.0, the game is considered complex. 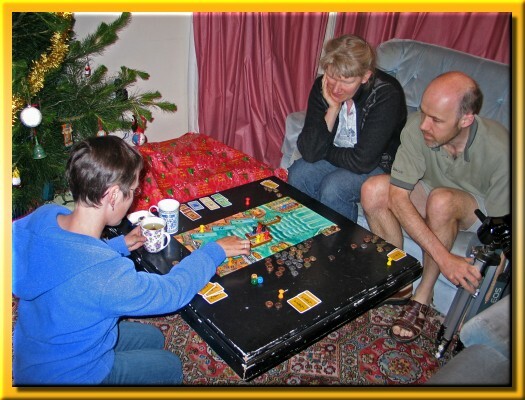 Money is tight throughout the entire game of two or more hours and players are challenged from many different angles in a intricate balance between wealth and resources. Age of Steam rates an amazing 8.07 on the geek and many hold it up as the only game they’d retain on their shelf if they were forced to liquidate their collection. However, even being that good, would it get played in my group? Maybe once, maybe twice at most but reluctantly. Even being the best in its class…it doesn’t make sense to own this title. And now for something completely different. Fjords is at the complete other end of the spectrum from the previous games. Nonetheless, it’s still on my radar screen as a good game for two. It seems silly to not pull the trigger on this one. At $13 at Game Surplus I should just get an order together and throw this in to fill in the empty spots in the box.I’m a sucker for tile laying games and when you slap that together with an area control game, nice wooden bits, and a short play time I think you’ve got a winner for the family, the office, and as a filler for game night. This one is definitely going into my next order. Trias is a light (2.46) game for 2-5 players that rates a 6.86 on the geek. This tile and card-based offering depicts the rise and fall of dinosaurs on an ever changing Pangaea. Being a fan of Carolus Magnus, the modular board is what caught my eye initially. The direct confrontation might be a little bit of a sour note in my group as some of the members tend to feel picked on a bit.With a playing time of only 45 minutes and currently listed for only $16 at Game Surplus, it seems silly to not throw this one in the cart as well. El Caballero is one of those games that I’ve had blinking on my radar for years now. If I’m not mistaken, it’s been out of print ever since I go into boardgaming some six years ago. The game, as you can tell, involves laying tiles in an exploration theme but it’s my understanding that the theme has little to do with this quite cerebral abstract. The game is the brainchild of Wolfgang Kramer (6-Nimmt!, El Grande, Gulo Gulo, Hacienda, Die Händler, Maharaja, Mexica, Tikal, Torres, Java, …) and Richard Ulrich (El Grande, Die Händler, Princes of Florence) and was tagged as the sequel to El Grande but I really can’t see the resemblance.For a tile laying game, you wouldn’t expect the brain burning 3.37 weight stamp but there you have it. The 6.82 rated offering supports 2-4 players and takes about 90 minutes so would my group give it a shot? I suspect they would but I have a few reservations: price and analysis paralysis. This out of print title runs about $50 in the marketplace and the brain burning choices will cause it to be played at a snails pace sucking all of the fun right out of it. Although I’d like to have it…I doubt it would get played. The overall size of the gray blob is an indicator of how my top 10 favorite games fit in the clusters. The right side is Eurogames and the left side is Amerigames. 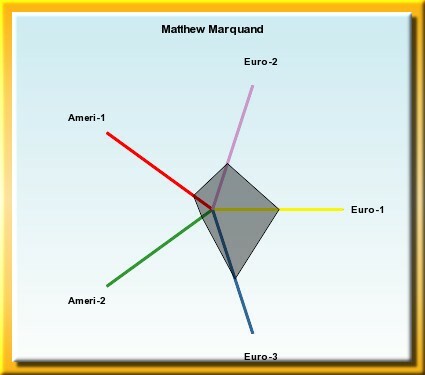 The specific varieties of Euros and Amerigames are labeled on the axes. A blob skewed to the right represents a more Eurogame game or gamer, to the left more of an Amerigame(r). Up and down seem to be correlated with game ‘weight’ or approachability. Up is ‘lighter’, down is ‘heavier’. Euro-1: Core Eurogames, like Puerto Rico. Euro-2:Family Eurogames, typically lighter, like Settlers of Catan, Carcassonne and Ticket to Ride. Euro-3: Heavy Eurogames, such as El Grande or Tigris & Euphrates. Ameri-1:New style American games, typically with lots of plastic miniatures. A best cluster match quality result above 1 means I match that cluster fairly well. Below about 0.6, means I don’t match anything that well. There’s a great geek list that describes the clustering and you can even try it out for yourself. In general, I’m one of the masses of the ‘run of the mill’ users of BGG. I usually lurk without posting and I rarely have anything insightful to state about games or the hobby. I have, however, hit the top ten for submitting a ‘hot’ image several times and I’ve even hit the hottest submitted image on two occasions. I’ve attempted a few serious geeklists but I possess neither the breadth of titles played nor the ability to write coherently about some novel feature of the hobby. So, in general, my ‘thumbs up’ recommendations come from image submissions and inane geeklists. I recently changed my avatar from the one on the left that represented my fondness for the game Maharaja to the completely non-gaming concept on the right. I’ve been playing so few games lately that I have no more desire to play Maharaja than I do any other of the games in my collection and so I switched to an avatar that represents my recent trip to New Zealand which I greatly enjoyed. There are a handful of geeks with whom I’ve exchanged personal email and I’ve even met a few in person at CABS (when I was a member) or at Origins. In general though, I stick with playing games with my family and with my regular gaming group made up of current co-workers, co-workers from years past, neighbors, and a brother-in-law thrown in for good measure. About a year and a half ago, I struck up an email-based conversation with a BGG member who lived in New Zealand. BGG had recently added the ability for users to specify additional profile data about your other likes and dislikes (music, television, books, etc.) and I’d clicked on the ‘woodworker’ tag to see who else liked woodworking. After a few emails concerning woodworking and the IT industry in NZ we stopped exchanging emails and that was that. When Lisa and I decided to bite the bullet and ‘just do it’ I sent him another email to solicit input on our itinerary and to see if he had any input on other places we might want to see. And wouldn’t you know it that after several emails, he had invited my family to stay with them in New Zealand and to play some games. We were a little nervous when we arrived about staying with a family we’d never met before but if they were boardgamers, then they can’t be too bad right? When we arrived at their house it wasn’t five minutes and Sophie and Noah had disappeared with their 5 children and Lisa and I settled in nicely with J. and A. (names withheld since I haven’t okayed publicizing their identities). We had brought a copy of Manila as a gift and I think it went over very well. Thanks to BGG, I was able to peruse his collection and be in a better position to offer something that fit their style. Over the course of two nights, we played two games of Manila, a game of Palazzo, Coloretto, and I taught J. the game of Hive using the travel copy I made in my woodshop. L. had a great time teaching Noah Axis and Allies: D-Day. I have very fond memories of our trip and it would have been a really different experience had we not spent time with some very special New Zealand natives that were kind enough to open their home to us, and play some games with us. I also have to commend BGG for providing a great forum for us to communicate on so many levels beyond gaming and in such a way that profoundly changes who we are. 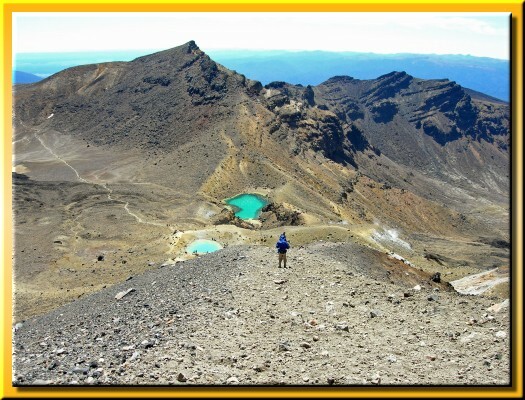 Tongariro Crossing is often regarded as one of the best one-day hikes in New Zealand and after having done it, I can see why. 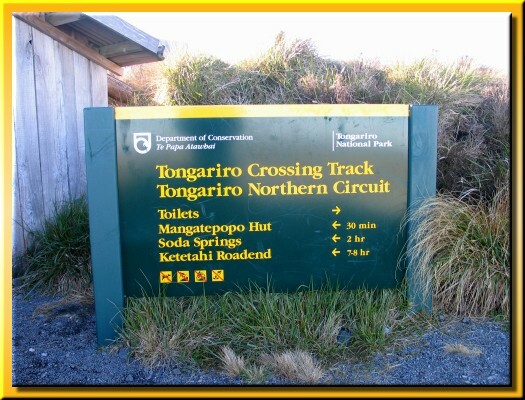 As we were planning our trip, the crossing was one of the ‘must do’ items on the list. The crossing is a 17km one-way hike best hiked from the Mangatepopo Trailhead to the Ketetahi Roadend. We booked a shuttle to pick us up at the end and set off on the earliest shuttle we could find to get to the trailhead. 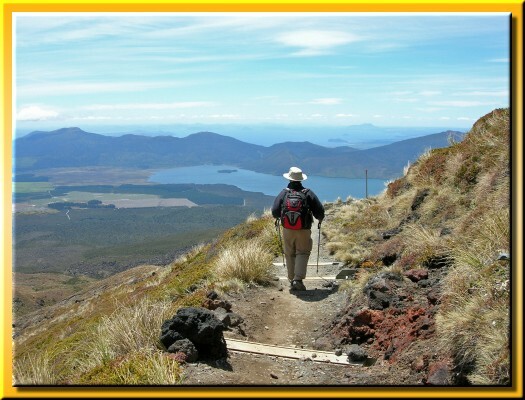 The trail is a rigorous hike across steep and rocky terrain crossing the saddle between two volcanoes: Tongariro and Ngauruhoe – Mt. Doom from Lord of the Rings. On the day we crossed, the saddle was extremely windy and quite cold but the sky was cloudless and you could see for 80 miles or more. On the climb up you could even catch glimpses of Taranaki, a huge cone-shaped volcano on the west coast some 75 miles in the distance. 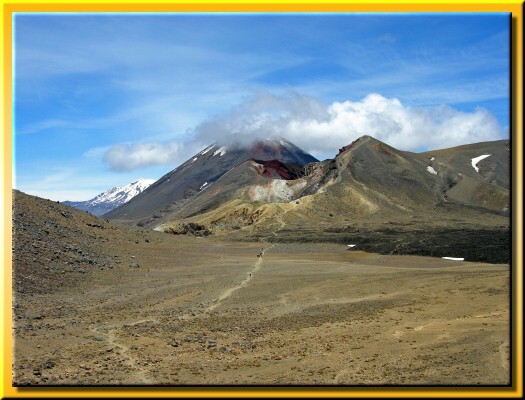 In the shot above, you can see Ngauruhoe rising on the left and people on the trail as they head up to the saddle where I was standing. As you descend to the Emerald Lakes, a trio of sulpher-smelling turquoise-colored lakes, we had to be very careful of the steep talus slope. The footing was very poor and about 90% of the way down I lost my balance, fell, and severely twisted my ankle. As I was falling I heard a loud pop and thought for sure that I’d broken my leg. Lisa had some athletic tape and she quickly taped it up but even using her trekking poles I wasn’t sure I’d make it out. With about 5 more miles of mountainous terrain to go I was both concerned that I’d need to be helicoptered out and that I’d pretty much ruined the rest of the trip for myself and everyone else on just day 5 of 27. 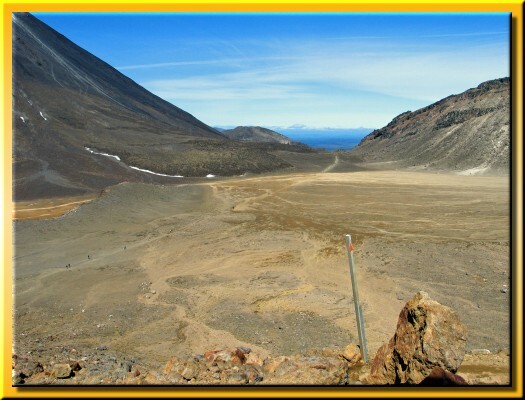 By the time we reached Blue Lake and looked back towards Tongariro, I was in quite a bit of pain but I knew that I’d be able to make it down as long as the trekking poles held out, I could take my time, and I didn’t miss that last shuttle. We amazingly made it down to the road end about 30 minutes before the final shuttle but it was a long slow haul. Both Sophie and Noah did great for the entire 17km and they should be proud of themselves for gutting it out while going up the “Devil’s Staircase”. I can’t imagine I would have made it without the tape, without the trekking poles, and without Lisa hanging back with me talking and taking my mind off the pain. By the next morning I couldn’t walk and my foot looked like a black pumpkin. From about midway down my calf to the ends of my toenail beds, I was black and blue and extremely swollen. This picture was taken within minutes of returning from the hike and before the tape came off and the swelling really kicked in. The day after the hike we traveled about 40 minutes south of Whakapapa to see a doctor. Although he had no x-ray he didn’t think anything was broken but he assured me that I’d done a bang up job on my ankle. Lisa had to take over the job of driving the campervan for a few days which she was really thrilled to do. She couldn’t wait to try driving on the wrong side of the road! We didn’t have any hikes planned for next few days so it turned out that it didn’t put a horrible crimp in our plans. By the time we left Christchurch, after some boardgaming (a great story for another time), I was able to drive again, get a shoe fully on my foot, and to hike albeit more slowly than usual. It’s been almost a month since I sprained it and I’m still not 100% back to normal. At times, I still have quite a bit of pain in my calf but each day things are looking brighter. The limp is getting less noticeable and most of the swelling is gone. In any case, even spraining my ankle couldn’t dampen my outlook on an amazingly beautiful country. 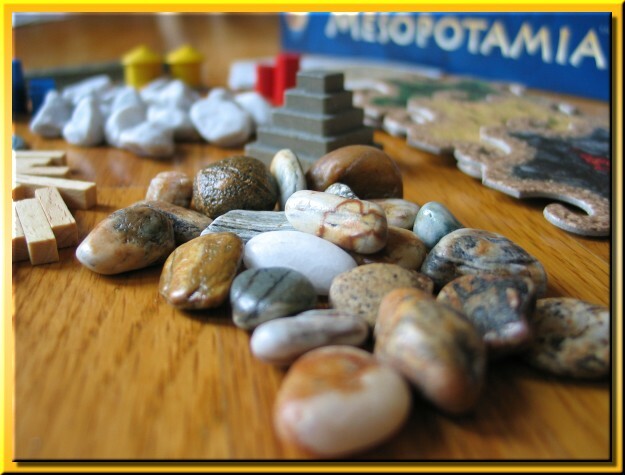 Although Mesopotamia has nothing to do with New Zealand, the game components include real rocks. While in Hokitika last month, we visited a rock strewn beach and that got me thinking about finding some good replacement candidates. After a quick spritz of clear spray sealer to bring out the color, here are the results. I doubt I’ll play any better but at least every time I get the game out, I’ll have a little something to trigger some fond memories of our trip.